For American River College’s softball team, it was a season that began and ended with new faces in the starting rotation. In its season finale, a 13-5 home win over Modesto Junior College, seven of its nine freshmen on the roster started the game. For its season opener, a 10-6 loss at Solano, starting pitcher Sharie Albert made her first career start after tearing her ACL three years ago while at Sierra College. The team finished the season with an overall record of 20-17 in the regular season, 9-12 in conference and make the playoffs, where it lost to undefeated San Mateo College. Albert said that the team was surprised to make the playoffs. “Overall, the team was shocked but not overwhelmed. Personally, I know there was some kind of chance we could have made the playoffs,” said Albert. Despite this season being Albert’s first as a starter, she played 34 games and started 26 of them. Softball head coach Lisa Delgado said that Albert improved every game, a sentiment she agreed with. “I’ve improved mentally and physically. Overall, I would have to say it was a good first season. It makes me excited for next season,” said Albert. ARC’s second game of the season against West Valley College was called halfway through the doubleheader because of darkness, but the game was never rescheduled. The team then went on a tear by winning seven of its next nine games, keeping four of those opponents scoreless. In that same stretch, they also shutout College of the Redwoods and Yuba College by scores of 13-0. At the midpoint of the season, ARC had a record of 12-5. After this streak however, the team would win no more than two games in a row for the remainder of the season. In March, losing streaks would become the norm as it dropped four games in a row. Half of those losses came in a doubleheader match at Cosumnes River College, who ended up winning the Big 8 Conference. After the losses, ARC would rebound to crush Modesto in a late March doubleheader by scores of 11-1 and 20-9. Despite the stumbles, ARC would hold down a 19-13 record heading into the final five games of the 2014 season with a chance to secure a playoff spot. However, a late season collapse ensued and ARC lost four of those final five games. In those four losses, the team would not score more than three runs. “We were really pushing to make the playoffs in those final five games. We were in every game, (but) we just didn’t get some timely hits,” said Delgado. Two of those losses came on the road at Diablo Valley College. ARC struggled to win on the road for much of the season, going 4-10 while accumulating a record of 15-6 at home. This offensive inconsistency plagued ARC throughout the season, as it scored more than 10 points eight times during the season, all of which were wins. Infielder Jennifer Woo finished the season in a four-way tie for the sixth most doubles in the state. 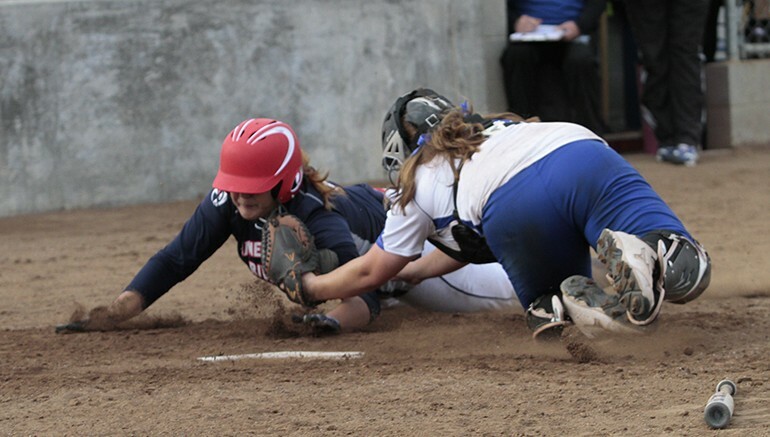 Be the first to comment on "Softball’s season ends in playoff loss at San Mateo"